Poisonous pit vipers, which include rattlesnakes, copperheads and water moccasins, can strike at a target up to two-thirds of their body length when provoked. Don't take a chance when in snake country! Razer brand snake gaiters provide snake bite protection from your ankle to your knee. Unique design of 13 polycarbonate panels offer protection— 1 large center panel plus 12 narrow panels on each gaiter smoothly wrap around each calf. 1000 denier nylon cordura covers polycarbonate inserts to stop snake fangs, cacti needles, briars, thorns, sticks, etc. One size fits calf diameter of 13-20 inches when measured over pants. Each light-weight gaiter is only 13 ounces — a pair is 1 lb, 11 oz. Black color with tan Razer logo. Each pair of Razer snake gaiters comes with a FREE nylon storage bag with locking drawstring cinch cord. Great for keeping your vehicle or backpack clean if your gaiters are wet, muddy, or dirty when you take them off. 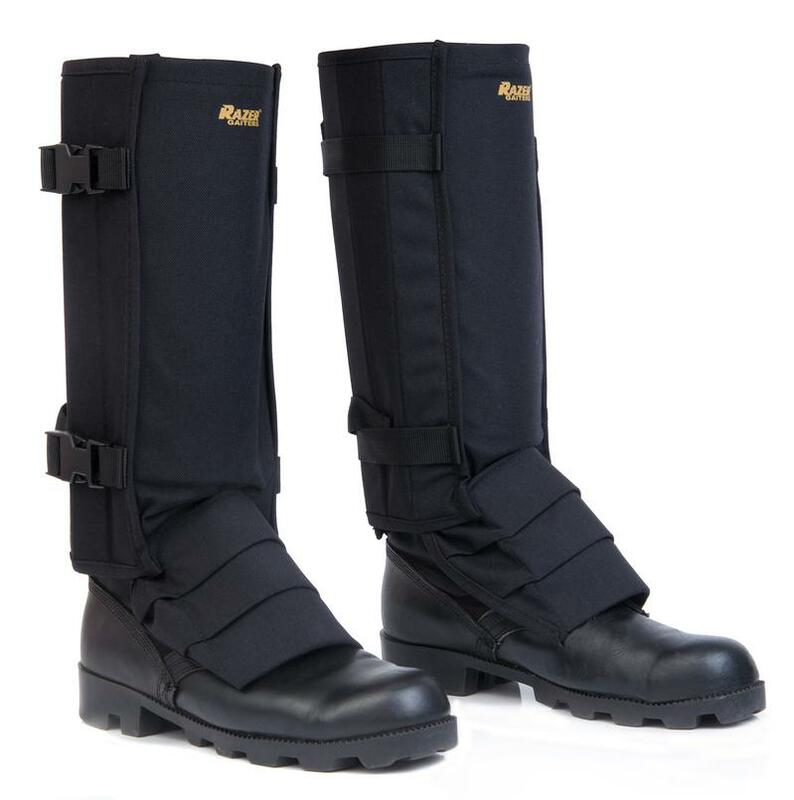 Always wear gaiters over pants and with thick boots that fangs cannot penetrate so your entire foot is protected. For shipping outside of the USA for black Razer gaiters only, please place your order here.